Hvidbjerg window introduces new, exclusive and environmentally friendly surface treatment of plastic windows. With Hvidbjerg window online window system, you can easily and quickly test our various windows and doors at pictures of your own house. New windows and doors should compliment a building’s design and architectural lines to achieve maximum effect. 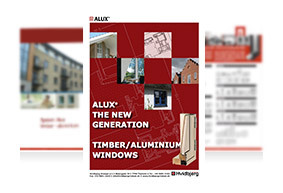 Download the latest Alux® brochure.